Chair of Holmes Chapel Parish Council Councillor Steve Ranger with Cheshire East Councillor Les Gilbert presenting Bill Bowers, treasurer of Holmes Chapel Community Cinema, with of over £1000. Cheshire East Council has given a community cinema group more than £1,000 to help get it off the ground. 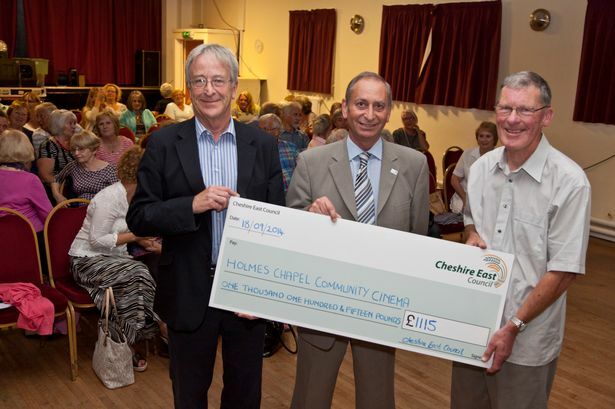 Holmes Chapel Community Cinema, known as HC3 for short, has held its first screening and Cheshire East Councillor Les Gilbert was on hand to present a cheque for £1,115 from the council’s community grant scheme to support the new venture. Cllr Gilbert said: “This is a great example of a community-led project and projects such as this illustrate the strong sense of community that exists in Holmes Chapel. HC3 secretary Judith Nichols at the ticket desk. “I want to congratulate HC3 chair Peter Clinton, its treasurer Bill Bowers and the rest of the team. “I know that a lot of effort has gone in to this and I was very pleased to see such a strong turnout to see their first screening. “Cheshire East Council is pleased to be able to support the project by funding the start-up costs. Holmes Chapel Parish Council chairman Steve Ranger added: “This was a fantastic night for the village – the fruit of some brilliant work by the team, who set this up in a short time. “The project was triggered by the results from a parish council survey to find out what things the people of Holmes Chapel wanted in terms of facilities, and the show of interest for a community cinema was very strong, with over 200 households saying that it was one of the things they wanted. Holmes Chapel Community Cinema treasurer Bill Bowers said: “The community cinema is being run on a non-profit basis. The aim is to make the cinema self-sustaining but it needed a bit of financial support to get it going. “We have set up a website www.hc3.uk where we will advertise upcoming screenings and we plan to use some of the grant money to put up a notice board at the library.